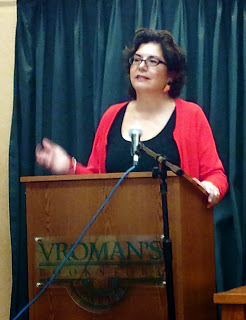 At my book launch. I had no idea what the future held for me and The Sandoval Sisters. You have been selected by LatinoStories.com among the 2014 Top Ten "New" Latino Authors to Watch (and Read). This recognition is based on feedback the co-editor and I have gotten throughout the year from readers, librarians, editors, and faculty, and it is also based on our own impressions of your work. Our site's mission is to promote Latino literature, but we're especially proud to promote the best of the best. Feel free to show off this recognition in any way you feel is appropriate. And please--keep on writing! The list starts with Supreme Court Justice Sonia Sotomayor's memoir and not only includes novels, short stories and poetry, but also spans the globe in terms of Latino/a ancestry and interests. 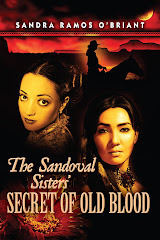 Mine is the lone New Mexican story, fitting for The Sandoval Sisters who broke the boundaries set for them by their gender, time, religion and region: the extreme Northern reaches of New Spain. ". . . a page-turning work of historical fiction with drama that multiplies . . . [written] in a style that will make it difficult to put this novel down." I'm grateful to all my readers who recommended this honor and to Dr. Gonzalez for his website and encouragement.